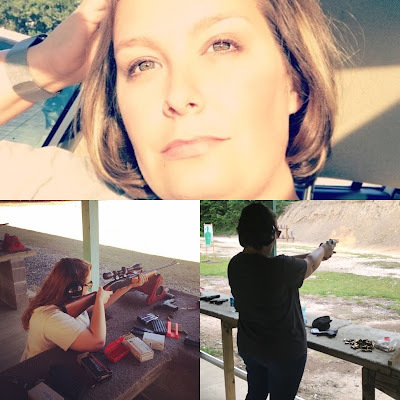 Matter of Facts Podcast: Why feminists should lose their minds over gun control. Why feminists should lose their minds over gun control. Feminists should absolutely have a fit about gun control. My reasoning is pretty simple, if perhaps a little sexist. My wife for example is a beautiful and confident woman. She is not tread under by her husband (ask her, she'll laugh), and is by all accounts a very independent lady. She's also Hell on wheels with a rifle, and is turning into a very accomplished pistol shooter with some practice. She is also woefully unprepared for a hands on violent encounter if she is unarmed. There is simply, factually, no contest of strength or violence in which I can see my wife being able to overtake and subdue me for example. I'm a 250 pound Army veteran, with several years of martial arts training under my belt when I was younger and skinnier. The deficit between us in terms of raw strength is something she can not reasonably be expected to offset with her bare hands. But, put a handgun in those hands and suddenly we are very obviously equal. She, armed, is easily able to fend off a violent attacker, and that is why gun control frustrates me so badly. With my bare hands, or one of my everyday carry knives, I would give myself equal odds fending off a violent attacker. I would always prefer a carry gun for defense, but I like my odds without a gun a lot better than my wife's, or any woman's for that matter. Contrary to whatever tarted up feminist fantasy Hollywood has rolled out recently, women are at a phenomenal disadvantage in a violent encounter against a physically stronger and often larger man. This is why I have always asserted that women, the elderly, and the physically less capable are harmed by gun control much more readily than are men. So, the next time someone starts to trumpet gun control as a means to protect the innocent, gently remind them that gun control laws are a poor substitute for a person's ability to defend themselves in the manner in which they see fit. Remind them that Smith & Wesson, not diamonds, are a girl's best friends. Remind them that the people most disadvantaged by restrictions on the 2nd Amendment are the people that are already at a physical disadvantage in a violent encounter.